Do you have a lot of apps that are just “there” and have no use? This is a commonly found situation among smartphone users and is actually a problem these days. Having too many unused applications can actually slow down your device and hinder its performance by continually restarting in the background and hogging your RAM. They can also inconspicuously take up a large chunk of your device’s memory without you knowing! So here is a simple guide that will help you tackle this problem by properly uninstalling your unwanted/unused apps. Go into the settings menu and search for “Application Manager”. Here you can see a list of all the applications you have downloaded so go through the list and find an app that you want to uninstall. After you have located your app, tap on it. You will see a new page with some words that may seem complicated but fear not, I’ve got your back. Scroll down to the bottom and find the button that says “Clear Defaults”. What this does is it liberates the app from any function which it has been set for. Now scroll up just a little bit and locate and tap the “Clear Cache” button. This clears up any residual data that the app has left in your cache memory. Next scroll up a bit more to find the “Clear Data” button. Hit this up to delete any data that the app has downloaded or installed into your device. Scroll to the top now and hit the “Force Stop” button. This is done to make sure you don’t have the app running when you uninstall it and risk a crash or errors. 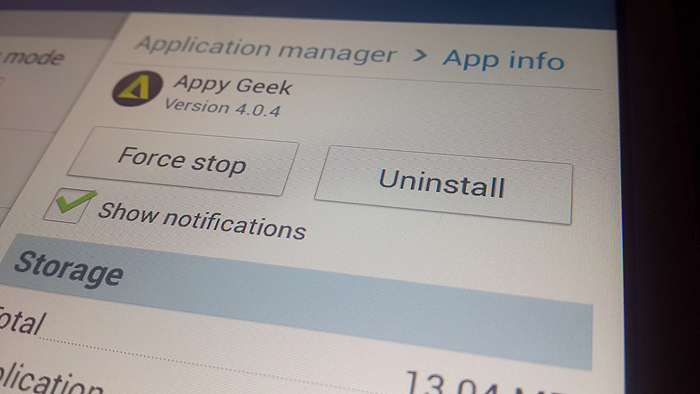 Finally, tap the “Uninstall” button to permanently remove the app from your device. Bonus Tip: Download and application such as Clean Master to regularly clean up your cache and keep your RAM usage in check. Nice tip Alavi, I am using clean master and its a great app to have.